In the above output I see that my application is now 97.5% idle which is a good thing and matches my expectation, as this robot is just waiting to run on a track. How to get that kind of information? For the graphical view in Eclipse in need an Eclipse plugin (see Better FreeRTOS Debugging in Eclipse). That plugin is already pre-installed in the NXP MCUXpresso IDE. This command is available on the McuOnEclipse FreeRTOS available on GitHub. FreeRTOS records at the time of every task switch how much time has been passed (or consumed) by that task switched out. 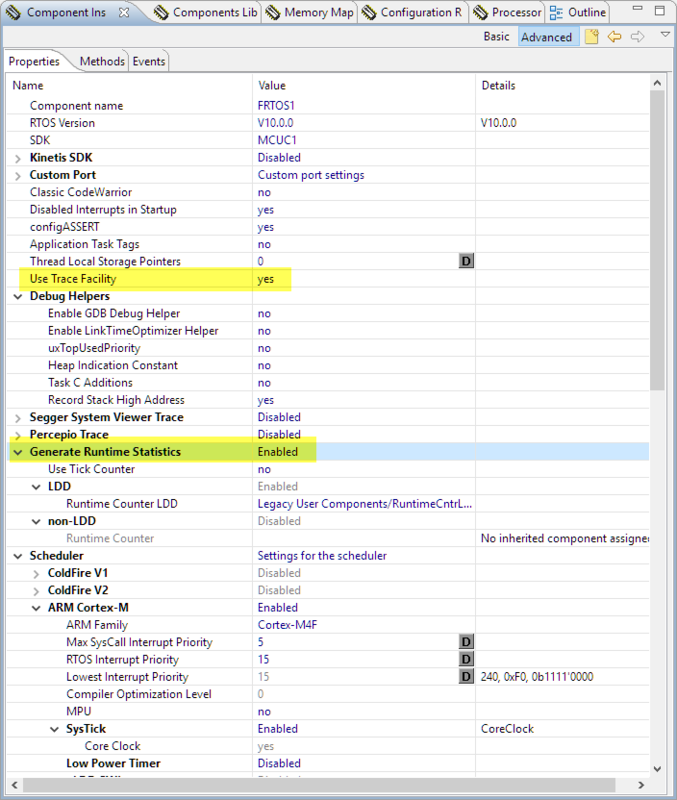 For this it uses a 32bit counter inside the task information structure. This is actually that counter which is shown by the ‘tasklist’ command under the ‘Runtime’ column. The percentage is then calculated based on the numbers which sum up as the total runtime. 💡 The counter value inside FreeRTOS is a 32bit value, so it is not really well suited for very long measurement periods. The first one is to configure the timer at RTOS startup, the second one is to return tha actual timer counter value. The general rule of thumb is that the timer used for measuring the task should be around 10x faster than the real tick counter for good results. **         This method is internal. It is used by Processor Expert only. **         from an interrupt service routine. The interrupt service routine counts up a timer counter which then is used to measure the time spent inside a task. With this, some basic measurement can be done. But this is not suitable for measuring short task execution time. Say the RTOS tick timer is 1 ms, then tasks running for less than 1 ms will be rarely measured. Another way to measure task execution time on ARM Cortex M (e.g. ARM Cortex-M4 or M7) is to use the Cortex Cycle Counter. That approach measures the cycle counter difference between two calls to AppGetRuntimeCounterValueFromISR() and counts up a counter based on that value. In order not to count up too fast, the counter value is scaled down with a shift by 12 bits in above implementation (using a 120 MHz ARM Cortex-M4). For faster or slower running cores you might need to tweak that value. FreeRTOS has built-in functions to track task execution time. 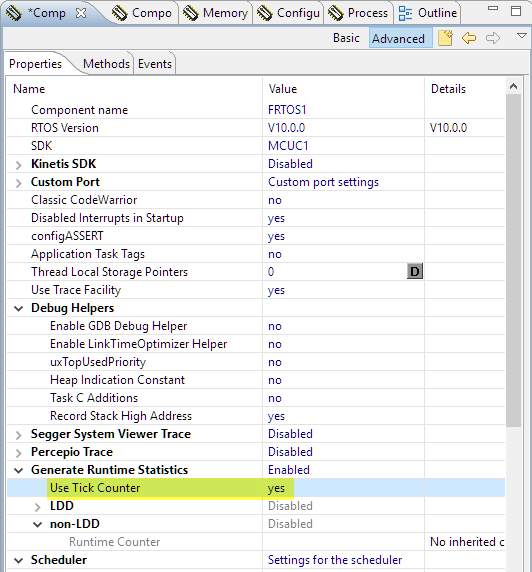 It is implemented with a counter inside each task descriptor so does not need much RAM. The application has to provide a counter which is typically 10x faster than the tick time to get some reasonable measurements. But even using the tick counter itself gives some rough performance analysis data. Otherwise the application can offer a periodic timer counter. If using an ARM Cortex-M3/M4/M7, using the ARM Cortex Cycle counter is an alternative, as it does not need any timer or interrupts. 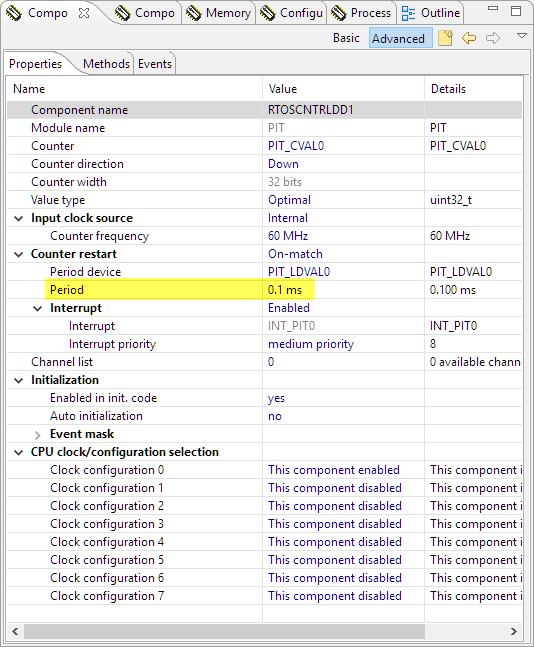 This entry was posted in ARM, Building, Cortex, CPU's, Debugging, Eclipse, Embedded, Embedded Components, FreeRTOS, gcc, Kinetis, LPC, MCUXpresso, MCUXpresso IDE, NXP, Processor Expert, S32, Tips & Tricks, Tutorial and tagged arm gcc, Debugging, Eclipse, Embedded Component, FreeRTOS, Interrupts, Kinetis, open source projects, Processor Expert, software, technology, Tips&Tricks by Erich Styger. Bookmark the permalink. The Kernel priority *always* have to be the lowest interrupt priority. This is the Systick interrupt priority. CubeMX tends to set the wrong priority for it. If only the IDLE task is running, it could be that you failed to createt the tasks? 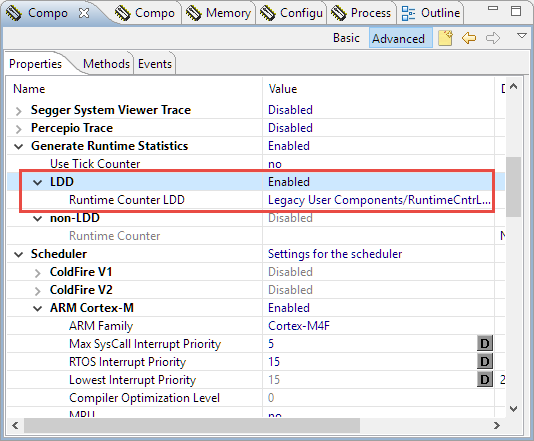 Have checked this with the debugger and checked the return code of the task creation function? Maybe you don’t have enough heap available for the stacks? Thanks for the quick reply, I got it working. I was using stack size of 1000 in xTaskCreate when I chaned it to 100 it started working.